Dairy Delight has huge … tracts of meat! 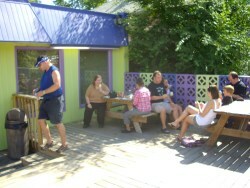 It was another hot Manitoba morning and the ice cream, burgers and deck offered by Dairy Delight fit the bill perfectly. Our order taker did so with a big smile on her face. She was quick and assembled ice cream floats for several of us while we waited for our burgers to be cooked. 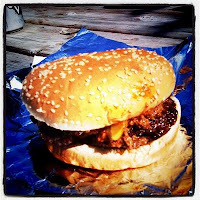 The burgers came out sequentially, but quickly, and one by one we headed out to the deck and shady picnic tables to enjoy our feast. 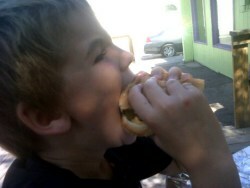 The burgers were massive - each patty easily 3/4” thick! My double was heavy! 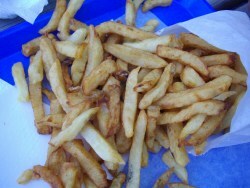 They were served piping hot with the outside seared crispy and the inside steamy moist. Most of us - including myself - had a double and I could barely finish mine. Dairy Delight makes the standard line up of burgers and cheeseburgers. They come with chili and also offer a Fat Boy with lettuce and tomato. There’s a chili burger too, which presumably comes with *even more* chili and is served in a bowl. None of us tried it today. 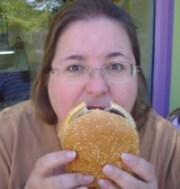 There was no bacon though - a basic accoutrement as Dani put it, but so many burger shacks don’t offer it. Must be a weird bylaw or something. 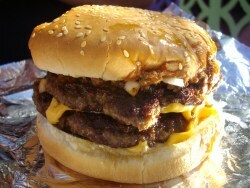 The burger patty was hand formed with a rough edge that made it even crispier and tastier. It was seasoned with lots of pepper. I feel like I'm in a meat coma though. The patties tasted great, and it was certainly a good value burger for the amount of beef you got - the second patty was only $1 more - but all I could taste was beef. I can't believe I'm saying that likes it's a bad thing! I think a single would've had a better flavour balance. Everybody loved their burger though, and gave it a high rating. Scott commented “After consuming I wanted to lie on the ground and have a midwife rub my belly.” Young Mitch dazzled us with his logic “There's too much meat, but it tastes like the right amount of meat”. Russ said the pickles were great. I’m not a pro-pickle guy. The only downside to eating on the deck was the couple of wasps that were around. Luckily girls taste better so the wasps left me alone. The tables were clean and in great shape unlike some other places we’ve dined where you wouldn’t eat any food that touched the top. Dani managed get grease on her shirt but stated "I always get sloppy, that's why I bring an extra t-shirt". Sandy noted “At one point it looked like Scott was doing a dine & dash and then saw he was heading to the "Bounce 'n Good Times! "” next door. The root beer float was awesome! 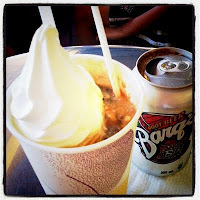 It had “tons of soft ice cream & little room for Root Beer - perfect!” as Sandy put it. It gets that root beer fuzz when soda meets ice cream. They give you the can though so you get to drink the leftover root beer. There was lots of Twitterpating going on today and it was good thing. 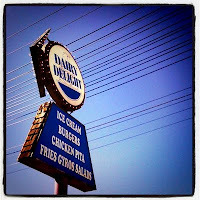 Big-T noticed and made a dash for Dairy Delight and is now Burger Club’s newest member. If you can find us - you’re in! Sandy had a great idea for +30 days = Margarita Club! Agree with you on this one...maybe like it even more than a 4.3. Love their fatboys here. They have great fries too and one of the awesomest (yes it's not a word but I'm making it one) tasting milkshakes in the city. Thumbs up. Took the grandkids for ice cream and I had a (large!) root beer milkshake - excellent! Best double cheeseburger in the city. Beautifully seasoned patties, perfect structural integrity down to the last bite, incredibly meaty but just tastes right. Fantastic burgers and fries.the best staff ever.